Hey y'all! 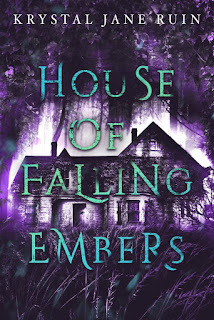 Today, I have a very special blog guest---one of my real-life friends, Jessica, who is here to tell us about a short but awesome adventure she had the other day. I've been trying to get Jess to start her own blog practically since I started this one. At least I got her to come along and guest post. Hello Blogosphere! This is Jess. I'm one of Michelle's friends who proudly takes the blame for dragging her out of her house for some fun excursions. So she asked me to write a guest post related to one of our adventures. About a month ago we went to see the Broadway show Hamilton. And just like she has, I have also become obsessed with the show. Through following the show and creator Lin-Manuel Miranda on Twitter, I've become aware of a sweet treat they provide fans called #Ham4Ham. 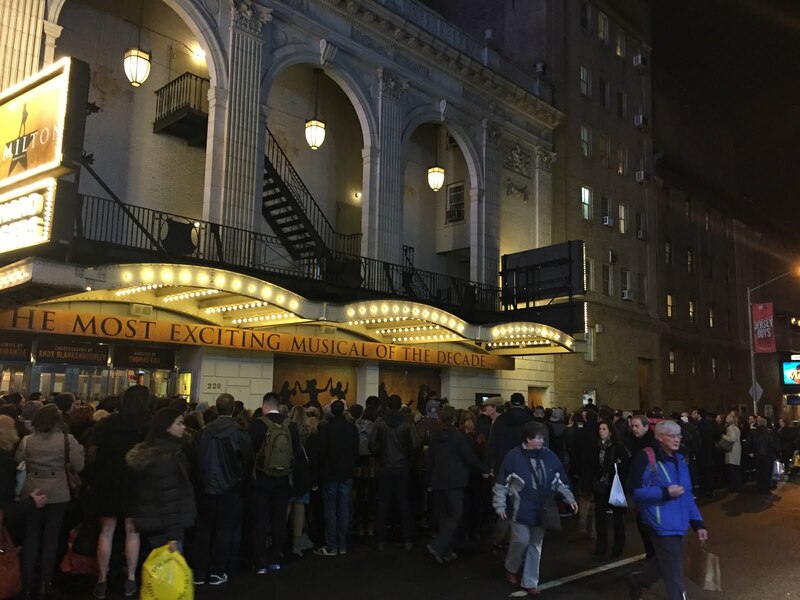 On certain 2 show days, some of the Hamilton performers (and friends) come outside the theater and put on a mini show in the time between the 2 performances. The concerts could vary between amusing lip-synching skits or songs from other shows. On Wednesday this week I happened to check Twitter and saw they planned a #Ham4Ham and since I had time to kill after work, I thought to check it out. 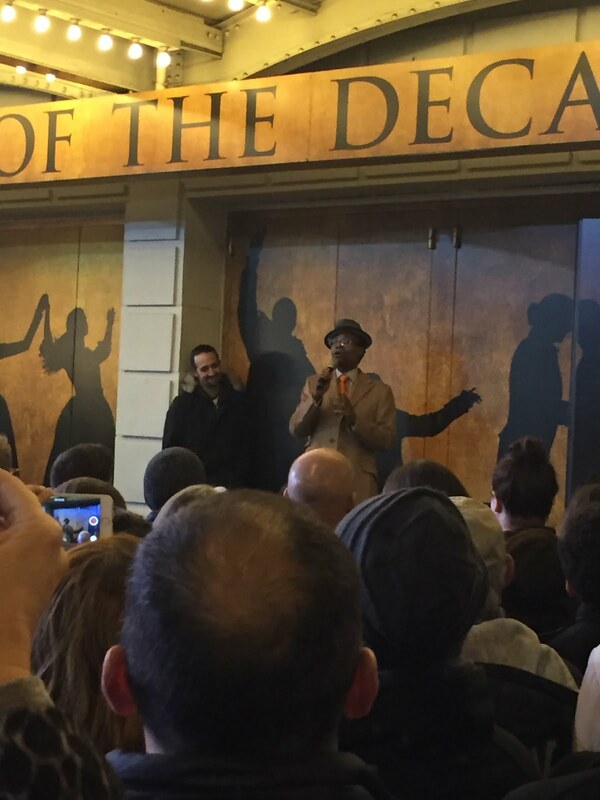 This time around, Lin-Manuel brought his Tony-winning friend Billy Porter to sing "Have Yourself a Merry Little Christmas." It was lovely. And given the large crowd outside, I don't think I've ever heard a Broadway street so quiet. 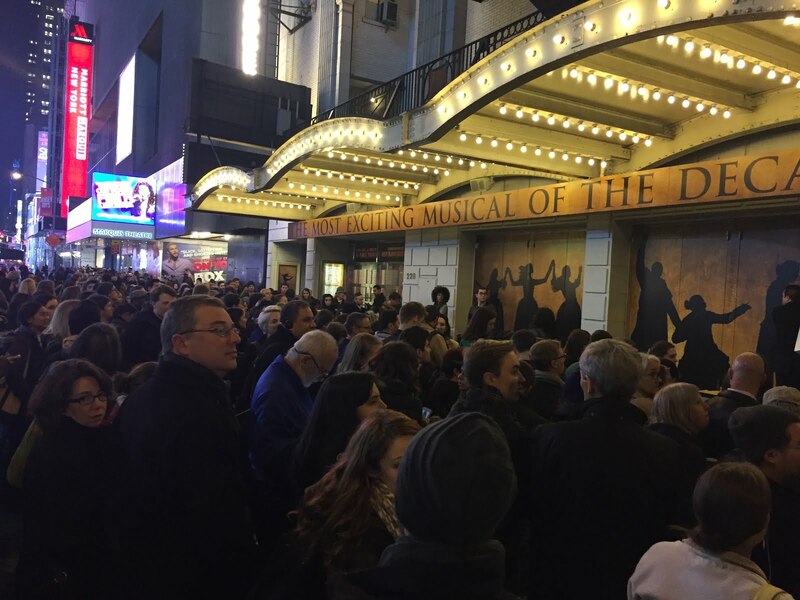 Another reason for the extra large crowd is that the #Ham4Ham show coincides with Hamilton's ticket lottery. Broadway lottery is a way for shows to sell a very limited amount of discounted tickets for same-day performances, but the catch is that you have to be at the theater at a certain time to throw your name in a bucket with (potentially) hundreds of others. When I was there for #Ham4Ham, I was mixed in with the largest lottery crowd of my life. I guess that's a testament to the hype Hamilton has gotten. I overheard a conversation where a couple tried 48 times before they finally won Tuesday night. So if you ever want to catch a show at a super discount, this is one way to go about it. I've seen a few shows this way (including Rent, Hairspray, Wicked, and others) and it's good if you have the time and patience to try your luck. Jess and I saw Rent through lottery once, when two of the original cast members were back on Broadway as Roger and Mark. We were front row center. It was really special. Plus, I think we saw Spring Awakening with student rush. Thanks Jess for coming and writing this for us, not to mention taking the pictures and the video! 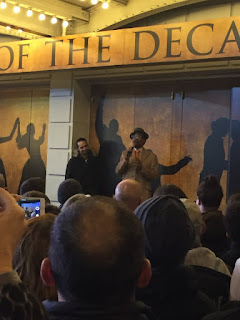 #Ham4Ham is a real show of the Broadway community, I think--you can check out a lot of Ham4Ham videos on YouTube. Hamilton's lottery tickets are, appropriately, $10. Has anybody out there ever rushed/gotten in a lottery for a show? Which one and when? I'm still waiting for Hairspray. It's a huge crowd--it's a super popular show now. We used to do lottery for some shows every so often--in some cases, the show isn't selling to capacity. Or, like in Hamilton's case, they reserve a certain number of seats for lottery. Hairspray seems to always be on tour, so I'm sure it'll come around!